LG starts global roll-out of G6 - AndroGuider | One Stop For The Techy You! LG introduced its first flagship of 2017, the G6 at MWC 2017. It went on sale in home market South Korea last month, and today, LG has announced the global roll out of the G6, which will start this week. 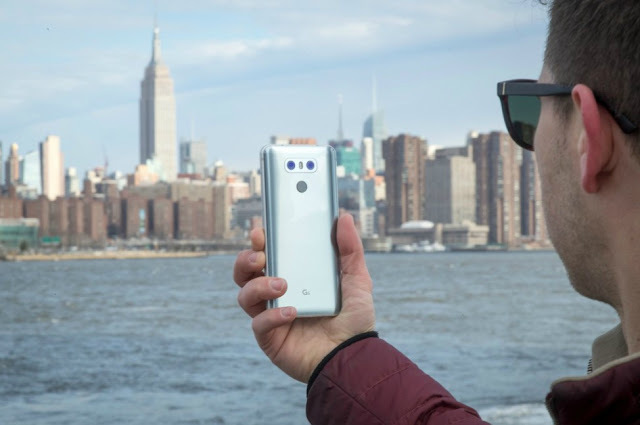 The LG G6 will go on sale in the U.S tomorrow April 7 via mobile carriers Verizon, Sprint, AT&T, T-Mobile and US Cellular for around $719.99 (Rs. 47,000). The price may vary depending on the carrier. On the same day G6 will also be available for purchase in Canada via carriers and retail stores. The G6 will also roll out in Asia, Europe, Central and South Americas, CIS, Middle East, Africa and more regions over the course of the next several weeks through about 200 carriers and operators worldwide. LG says prices and exact dates of availability will be announced locally in each market at the time of launch. With the G6, there's a lot at stake for LG, after the failure of last year's semi-modular G5. The LG G6 has already impressed critics and audience. “The initial reaction and feedback to the G6 has exceeded our expectations by far,” said LG. However, it is to see, how many are willing to open their wallet for the phone. LG says that the G6's design is "based on delivering what everyday consumers wanted from their smartphones". It sports a 5.7-inch display with 18:9 screen ratio in a compact 5.2-inch body with minimal bezels for easy one-handed operation, also known as Full Vision display. It supports both Dolby Vision and HDR 10. Other features include Snapdragon 821 processor, 4GB RAM, 32GB/64GB storage, 13MP dual-rear cameras, 5MP wide-angle selfie camera, Android 7.1 Nougat, 3300mAh battery, IP68 rating for water and dust resitance and MIL0STD 810G standard durability.